Unfortunately Safari on mobile devices does not offer an option for a HTML based video player to go full-screen. Apple is insisting on that function remaining reserved for the native iOS video player. This is why vooPlayer offers you two options when it comes to handling this. This will style the player so it looks like it's in full-screen mode, but it will only appear so. These styling options are delicate and are prone to running into conflicts with your site's themes and plugins. The good side of this approach is that all vooPlayer features will continue to work. If activated, vooPlayer will relinquish control of the full-screen over to iOS and the native video player will be used. This brings the video in to the actual full-screen mode and assures that no display or playback issues appear. However, by doing this. All vooPlayer features will be disabled whilst the player is in full-screen mode. How do I activate Native iOS full-screen? This is currently a BETA feature which can be accessed by activating the BETA features menu found at the bottom of your player settings. When should I use the Native iOS option? In most cases, there should be only minor if no conflicts at all with the vooPlayer iOS full-screen. However if when full-screen is activated there are obvious styling conflicts, we recommend activating this feature. However, if you have used vooPlayer features in the video which are critical, for example vooPlayer gates which should prevent viewers from viewing the video unless a specific action is taken, then iOS Native full-screen option should be avoided as it will allow users to see the full video. 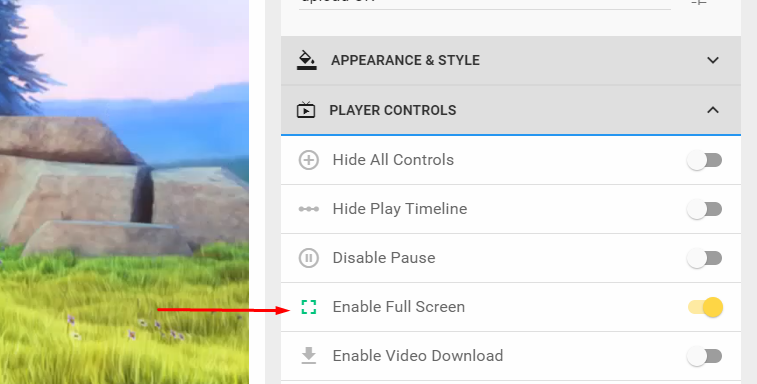 Keep in mind that if neither of the options satisfy your requirements, you can always completely disable the full-screen control option.